Growing crops to make green gas is a complex business. There are so many variables involved, things don’t always go to plan. When it came to the 2018 harvest, the weather was not on our side. A late, cold, wet spring led to a delay in seed drilling. The long, hot summer then severely impacted growing conditions. As if that wasn’t enough, Storm Ali came along on the 19th of September and damaged many of our crops – even flattening a percentage of them. In the end, yields were down 15% on projections. Of our 450 farming partners, those in Norfolk were worst affected, with some sites 22% down on tonnage expectations. The adverse weather was far from the disaster it might first appear. At Future Biogas, we’re so committed to the long-term viability, efficiency and sustainability of biogas production that we’ve built such meteorological variations into our business model. Thanks to our combination of strategic thinking technical know-how and in-depth data analysis, this year’s bad weather will not hamper our short-term output or our long-term growth. We pride ourselves on our commitment to the highest standards in everything we do. Our rigorous ethos means there are several ways we reduce the impact of unfavourable weather when putting our feedstocks into silage. First up, we concentrate on putting the best quality crops into the silage clamps, where we compact the harvested feedstocks. This ensures the highest possible gas outputs. 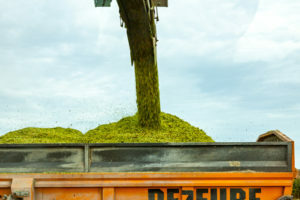 To preserve the feedstock quality and minimise the risk of contaminants, speed is always essential when gathering silage for anaerobic digestion (AD). Oxygen is the enemy in this process. Too much of it can cause the maize and other crops to break down prematurely. The idea is to limit their exposure before they’re covered. We work closely and quickly with our farmers to make sure the best of the feedstocks are put into clamps straight away. Every farmer knows that an air-tight clamp is the best way to protect its contents. We always make sure the highest quality sheeting is used to cover our clamps and seal them. Economising in this area is never worth it. Once fermentation has been accelerated, with the addition of the appropriate cultures, we then begin a series of regular checks. Throughout the fermentation process, we take samples of the ensiled product, to offer clarity on the expected gas yield. If need be, we purchase additional external crops and alternative feedstocks. This way, we meet our projections and produce the expected quantity of gas. To counter the changing weather that comes with global warming, these day-to-day practical steps are complemented by three ‘bigger picture’ measures. First up, we make sure we are never wholly dependent on any one feedstock. Although maize is our main fuel crop, we also use a range of others, including sugar beets, potatoes and rye. In addition, we use manures and other farming by-products in the fermentation process. When it comes to AD plants, variety is essential to both environmental and financial sustainability. Secondly, in terms of maize, we grow a wide range of varieties and maturity classes, so we are never dependant on any single type. We record each harvest meticulously. Guided by the previous success of particular varieties in different locations and conditions, we have developed the ability to map out our planting down to the finest detail – going as far as planning which variety to put in specific fields. Lastly, we work closely with our farmers, to ensure the highest quality of agricultural standards at all times. We provide them with hands-on help and guidance, especially during the peak periods surrounding the drilling, establishment and harvesting of crop feedstocks. We also offer advice on weed control and plant nutrition. In 2018 we might have been embattled by the ‘Beast from the East’, a long drought and then Storm Ali, but we have emerged unscathed. 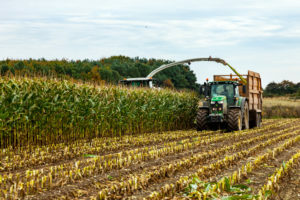 In the era of climate change, Future Biogas has honed the technical and agricultural expertise to mitigate the worst effects of unpredictable weather patterns on biogas production. That doesn’t mean, however, we don’t hope for better weather in 2019!